General Mills Cereal Deal $0.49-$0.99 a box! 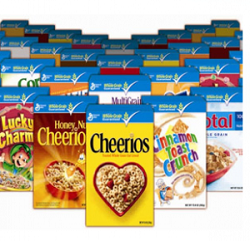 There are some great General Mills cereal deals using the current Mega Event deal. Get this deal at Kroger stores & Affiliates*. General Mills cereal is on sale for $1.99 each, and when you buy any 6 participating items get $3 off instantly, bringing the price down to $1.49 instantly, now add coupons! Final Price: $0.49 or FREE when you use the $1 Ibotta Cash Back too! Plus get the Ibotta Cash Back too! *Kroger stores & Affiliates: Smiths, Ralphs, Fred Meyer, King Soopers, QFC, Frys, City Market, Dillons, Gerbes, Bakers, Hilander, JayC Food, Pay Less Food, Scotts. Bottom Of The Cereal Box Recipes! YUMMY Treats! Free Grocery Shopping Video – Rolling Deals Explained. What’s best to buy in August? What’s best to buy in June? Welcome to TipResource.com where it's my goal to help you save money so you can spend more time on what matters to you and your family. By way of blogging and instructional videos, you will learn the tricks of the trade to extreme savings. Enjoy.